Die Jovis, 30 Maii, 1650. COLONEL Wauton reports from the Council of State, The humble Petition of George Lord Chandos Baron of Sudeley: Which was this Day read. A Certificate from Sil. Wood, Richard Ayleworth, Wm. Stratford, Justices of the Peace of the County of Gloucester, touching the Damage sustained by the Lord Chandos, by making of Sudeley Castle untenable, was this Day read. It was Resolved, That the Lord Chandos shall have a Compensation for his Damages sustained by pulling down Sudeley Castle. Colonel Harrison, Tellers for the Yeas: 31. Sir Wm. Armyn, Tellers for the Noes: 18. It was Resolved, That One thousand Pounds of the Remainder of the Fine to be paid in by the Lord Chandos, be respited, until the House have Satisfaction touching his Damages sustained, upon the Order of the Council of State, for making Sudeley Castle untenable. 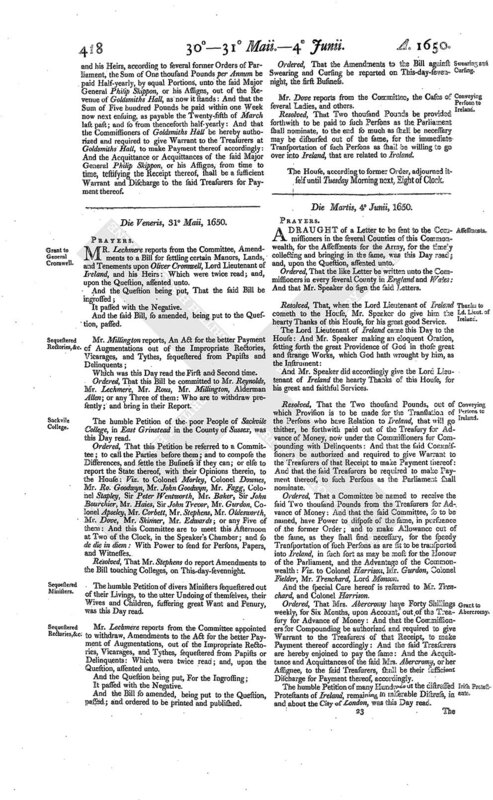 Resolved, That it be referred to the Council of State to consider of and examine what Damages the Lord Chandos hath sustained by their Order, in making Sudeley Castle untenable; and to make a speedy Report thereof to the House. An Act for settling certain Manors, Lands, and Tenements, upon Oliver Cromwell, Lord Lieutenant of Ireland, and his Heirs, was this Day read the Second time; and upon the Question committed to Mr. Bond, Lord Commissioner Whitelock, Mr. Trenchard, Mr. Dove, Major Lister, Mr. Holland, Sir Wm. Armyn, Mr. Corbett, Alderman Allen, Lord Commissioner Lisle, Colonel Temple, Mr. Stephens, Mr. Henry Darley, Mr. Richard Darley, Sir Richard Lucy, Mr. Attorney General, Colonel Marten, Sir Wm. Brereton, Mr. Lechmere, Mr. Reynolds, Sir John Trevor, Mr. Carey, Sir Tho. Widdrington, Mr. Garland, Mr. Burrell, Major General Skippon; or any Five of them; are to meet this Afternoon at Two of Clock, in the Speaker's Chamber; and so de die in diem. 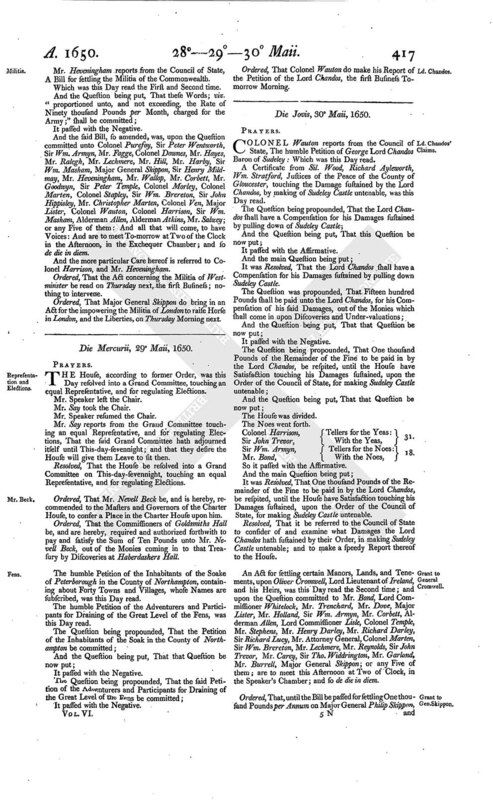 Ordered, That, until the Bill be passed for settling One thousand Pounds per Annum on Major General Philip Skippon, and his Heirs, according to several former Orders of Parliament, the Sum of One thousand Pounds per Annum be paid Half-yearly, by equal Portions, unto the said Major General Philip Skippon, or his Assigns, out of the Revenue of Goldsmiths Hall, as now it stands: And that the Sum of Five hundred Pounds be paid within one Week now next ensuing, as payable the Twenty-fifth of March last past; and so from thenceforth half-yearly: And that the Commissioners of Goldsmiths Hall be hereby authorized and required to give Warrant to the Treasurers at Goldsmiths Hall, to make Payment thereof accordingly: And the Acquittance or Acquittances of the said Major General Philip Skippon, or his Assigns, from time to time, testifying the Receipt thereof, shall be a sufficient Warrant and Discharge to the said Treasurers for Payment thereof.